The Saarland postage stamp shown above, at the top left (Mi. #357, Sc. #253), was issued on February 28, 1955 to publicize the Cross Country Bicycle Racing World Championship. 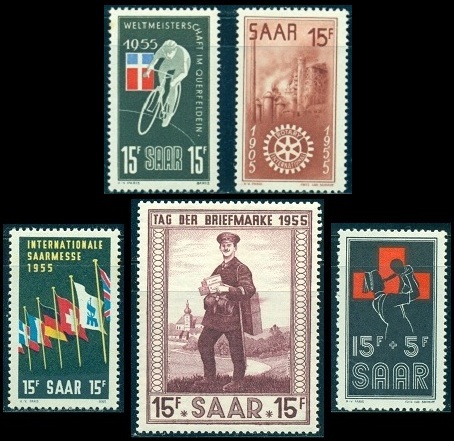 The stamp design features a cyclist and the flag of the Saar Protectorate. The postage stamp shown above, at the top right (Mi. #358, Sc. #254), was also issued on February 28 to commemorate the 50th Anniversary of the Rotary International. The design features the Rotary Club symbol and industrial works at Neunkirchen. The postage stamp shown above, at the bottom left (Mi. #359, Sc. 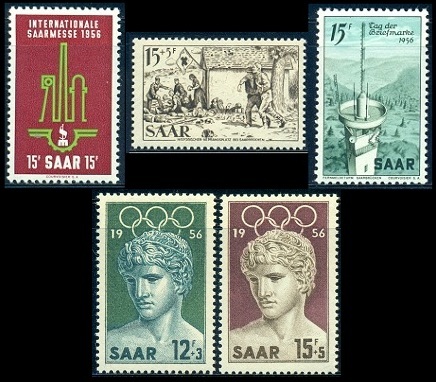 #255), was issued on April 18, 1955 to publicize the 1955 International Saar Fair held in Saarbrücken. The stamp depicts the flag of the Saar Fair, along with the national flags of the participating nations. The 1955 Stamp Day commemorative shown above, at bottom center (Mi. #361, Sc. #256), was issued on May 8, 1955. The design depicts a postman at Illingen. These stamps were also issued in miniature sheets of 10. The charity stamp shown above, at bottom right (Mi. #360, Sc. #B104), was issued on May 5, 1955 to publicize Red Cross Week. The stamp depicts a nurse holding a child and the Red Cross emblem. On October 22, 1955, the three definitive postage stamps shown above (Mi. #362-64, Sc. 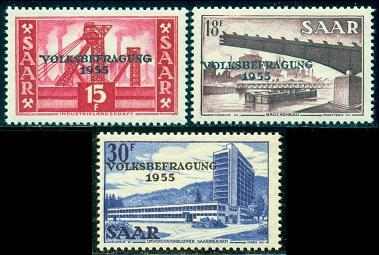 #257-59) were overprinted "VOLKSBEFRAGUNG / 1955" to publicize the Saar Protectorate Independence Referendum to be held on October 23. France offered to establish an independent Saarland, under the auspices of the Western European Union, but the referendum held on October 23 rejected the plan by a vote of 68% to 32%, with a 97% voter turnout. The rejection of the plan by the electorate was interpreted as support for Saarland to join the Federal Republic of Germany. 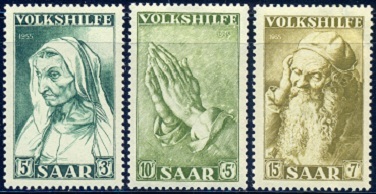 The annual Volkshilfe charity stamps for public welfare shown above (Mi. #365-67, Sc. #B105-07) were issued on December 10, 1955. The three stamps feature details from classical etchings by Albrecht Dürer (1471-1528). The designs are as follows: "Dürer's Mother, Age 63", "Praying Hands", and "Old Man of Antwerp". The postage stamp shown above, at the top left (Mi. #368, Sc. #260), was issued on April 14, 1956 to publicize the 1956 International Saar Fair held in Saarbrücken. The stamp depicts symbols of industry and the fair symbol. The charity stamp shown above, at top center (Mi. #370, Sc. #B108), was issued on May 7, 1956 to publicize Red Cross Week. The stamp depicts a first aid station in Saarbrücken circa 1870. The 1956 Stamp Day commemorative shown above, at top right (Mi. #369, Sc. #261), was issued on May 6, 1956. The design depicts a radio tower near Saarbrücken. The two charity stamps shown above, at the bottom (Mi. #371-72, Sc. #B109-10), were issued July 25, 1956 to celebrate the Olympic Games in Melbourne, Australia. The stamps depict an athlete's head from the sculpture "Victor of Benevent". The surtax went to support Olympic athletes. Though athletes from Saar participated in the 1956 Olympic Games, they did so as members of the Federal Republic of Germany Olympic team. The three charity stamps shown above, at the top (Mi. #373-75, Sc. #B111-13), were issued October 29, 1956, to raise money for the reconstruction of historical monuments. 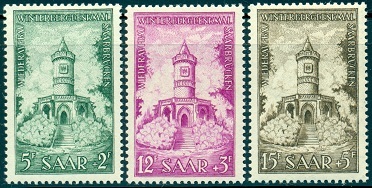 The stamps depict the "Winterberg Monument". The monument was built in remembrance of the Franco-Prussian War of 1870-1871. It was destroyed by the Wehrmacht in the early days of World War II. 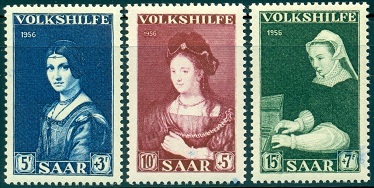 The annual Volkshilfe charity stamps for public welfare shown above, at the bottom (Mi. #376-78, Sc. #B114-16), were issued on December 10, 1956. The three stamps feature classical paintings of women. The designs are as follows: "La Belle Ferronnière" by Leonardo da Vinci (1452-1519), "Saskia von Rembrandt" by Rembrandt (1606-1669), and "Woman Playing Spinet" from "Family von Berchem" by Frans Floris (1516-1570). Under the provision of the Saar Treaty of October 1956, France returned the Saarland Protectorate to West Germany. On January 1, 1957, the former French Protectorate became a Federal State or "Bundesland" of the Federal Republic of Germany.